I have returned! The hour of your redemption is here! Issue 479 demonstrates an unswerving and resolute devotion to the principles of Doctor Who that challenges the very best that has been written on the pages of Celestial Toyroom, and, in consequence, have I got a fantastic issue for you! Full of Daleks and UNIT and more Daleks and David Tennant bashing and anthropology and more Daleks still. 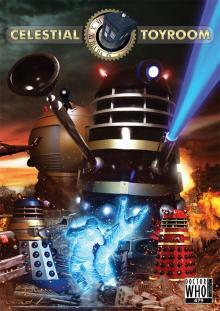 There is also a fantastic wrap-around colour cover by talented artist Andy Lambert of Daleks fighting with UNIT in central London! What else could you wish for, aside from more Daleks, I suppose!